The ignition switch looks complicated, but there are really onlyfive wires involved in the circuit. They are arranged in just two sets. Some model spiders have a warning light that will illuminate when the key is in the ignition. These wires are not part of the switch circuitand can be serviced separately. Most problems with switches are the result of burnt contactspreventing the connections from being made internally. With simple hand tools and a small drill, you can disassemble the switch and clean the internal contacts and restore the switch to normal operation. Instruction for this procedure is found HERE. Quite simply when the switch is off, no wires are connected. 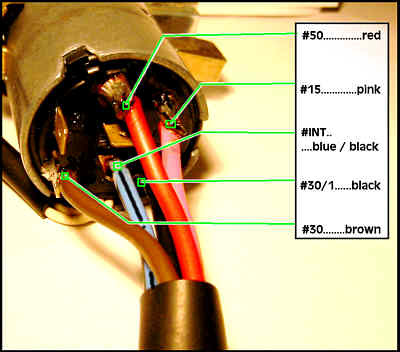 When the switch is in the Run position Blue/Black is connected to the Brown power lead, and the Pink wire is connected to the Black wire. When the switch is in the Start position the only change is that the Red starter solenoid lead is added to the brown wire connection. Loss of connectivity will cause intermittent issues like sudden engine dying or lights that won't stay on. Sometimes you can wiggle the wires gently at the back of the switch to get you home if this is the problem. Some model cars had spade connectors that cause problems. Early models had screw on connectors. Middle year cars had push on connectors. Most later year models had soldered pigtails to connect the wires to the switch. I highly recommend that if your car has spade connectors(push on), then remove the switch from the column and carefully solder the wires to the back of the switch. Polish replacement switches can be retrofitted, but the new replacement switches are not of the same quality as the OEM versions. OEM Switches are highly sought after by knowledgeable owners. With a little time and patience, it is possible to repair most OEM switches. Instructions for this procedure are HERE. Now that you understand the "secret" of the switch, you can help the switch to last longer by removing the high current that caused the switch to malfunction in the first place. All electrical current for the vehicle (with the exception of the starter motor and the alternator charging current) must pass through the ignition switch. With a little thought, you can use two relays to handle the current switching making your precious starter switch last indefinitely. This will be a topic for a future FAQ (or why not write it yourself and submit it to MIRA for publication? ).